Top community discussions about Juice! Is there a better alternative to Juice!? Is Juice! really the best app in System category? Will Juice! work good on macOS 10.13.4? Juice! 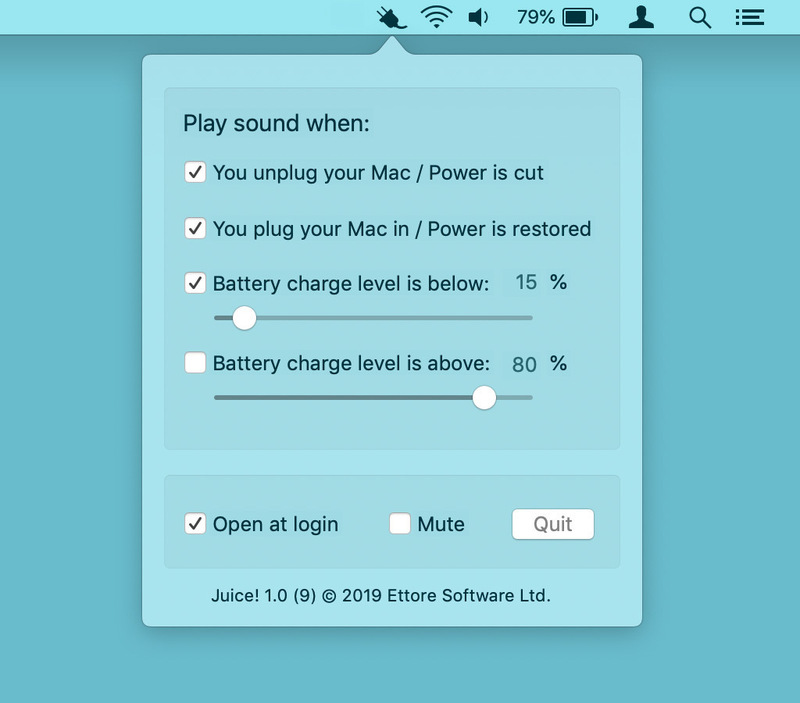 keeps an eye on your MacBook’s battery charge level and can play a sound when it’s time to plug in or when it’s OK to disconnect from the mains. Set it to warn you with an audio cue when you’re running low on battery or when the power supply to your laptop is interrupted. Juice! needs a review. Be the first to review this app and get the discussion started! Juice! needs a rating. Be the first to rate this app and get the discussion started! Juice! 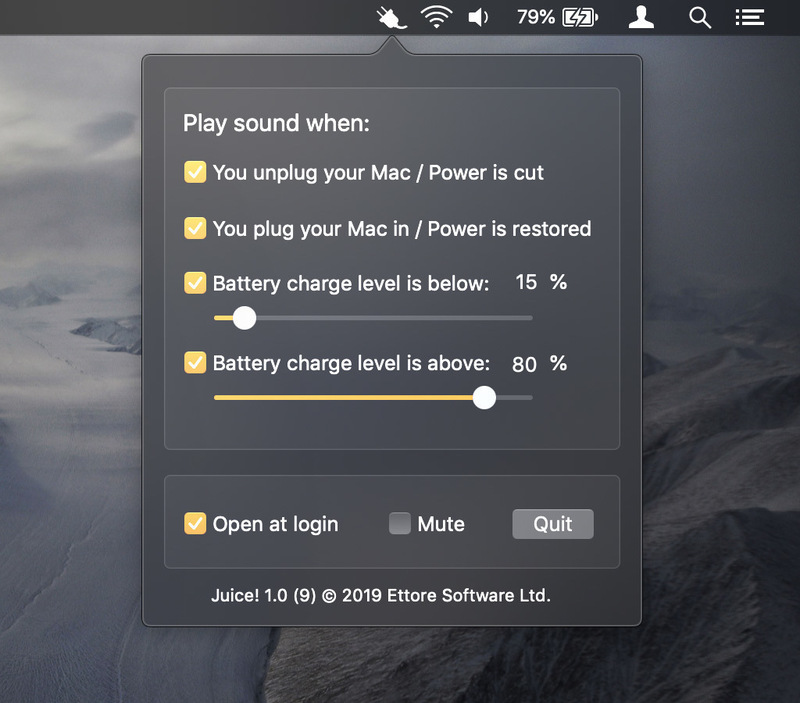 can help you get the most out of your MacBook’s battery. You may have noticed that leaving your laptop plugged in all the time can shorten its battery life. 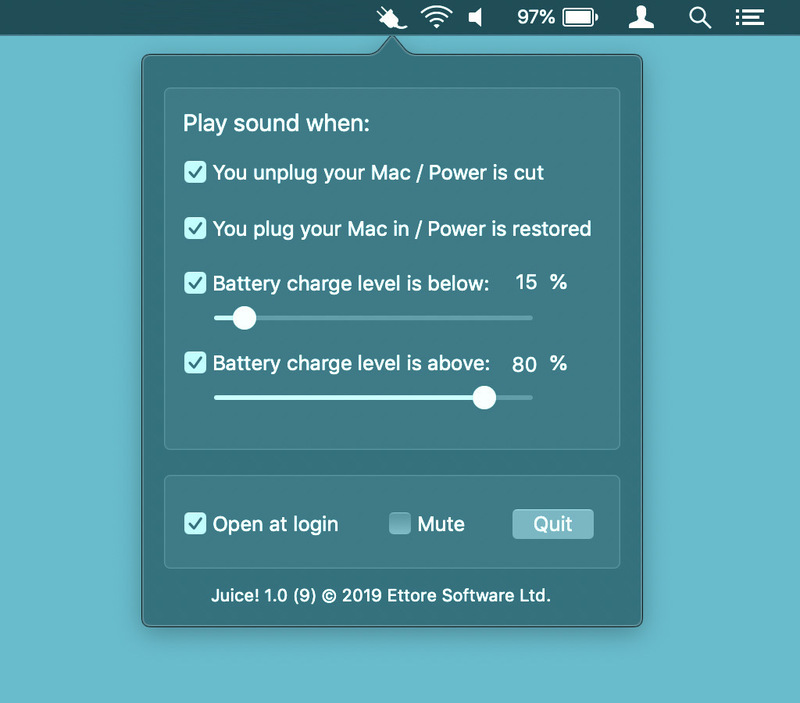 To keep it healthy, it’s recommended to fully discharge the battery about once a month and to maintain a charge level between 20% and 80% the rest of the time. You can set Juice! to play a sound when the battery charge drops below a level of your choosing, or when it’s reached a level at which you’d like to unplug. "Power has been cut" when you unplug your Mac or power is switched off at the mains. "Battery charging" when you plug your Mac in or power is restored at the mains after an interruption. "Please charge me" when the battery charge drops below a level you specify with a percentage slider. "You can unplug now" when the battery charge passes a level you specify with a percentage slider.